Wow, sorry for being MIA. The Spring semester is wrapping up so everything is barreling downhill towards finals at this point. Add to this the fun that is the New Works Festival I have way too much on my plate. Every two years the Dept. 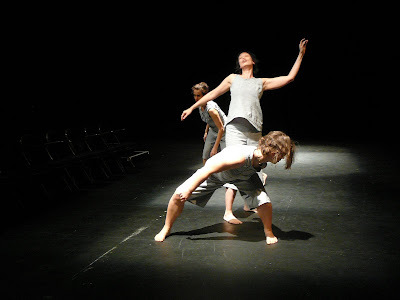 of Theatre and Dance at the University of Texas at Austin puts on the New Works Festival. This year there are 29 productions, spearheaded by students, showing in a number of venues in the theatre building, for an entire week. There have been numerous workshops with guest artists as well. And you know me, I just can't help getting involved. 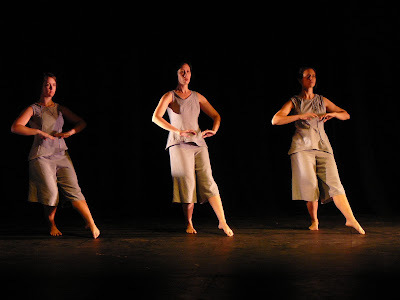 I designed, draped, and constructed the three costumes pictured here for a dance piece titled, "The Knot." (I did have a considerable amount of construction help from the director/choreographer, Julie). From the festival program, The Knot is, "A dance advancing 'the dream of the protection that is closest to us' - an investigation in movement of the geometry and origins of our everyday garments." For a costume technician /designer it was a chance to let my mind for technical sewing/embellishment go wild. It is difficult to see here, but there are pintucks, inverted darts, smocking, and quilting techniques incorporated into the bodices. I had a great time collaborating on this project. On another note though, I am glad to have this under my belt and move on to the three other big projects that have to be done before the semester is over! After finals wrap up, I'll have two weeks off before going to the Santa Fe Opera to work as a stitcher on the tailoring team. I'm so thrilled! That Guy is going to be making a job transition at that time, so he is going to allow for a couple of weeks off to come along for a weeks visit. We will head out before my contract starts to do some camping and hiking along the way. It will be such a comfort to me to have him there during the first week. I've never done what we in the theatre industry call "summer stock" before. Summer stock theatre and opera companies only produce during the summer months. This means that your contract is for anywhere between 6-12 weeks in length (mine will be 8 weeks, That Guy will probably visit at least one other weekend while I'm there, maybe two - we'll decide on that later). You pretty much work the entire time and you may or may not make a nice chunk of change. I will do well enough to work just those two months. For the third month I may pick up something here or there, but if I watch my spending I won't have to. Love it! As for knitting, sorry folks. Not much in that department right now. There's the ongoing sock and the baby blankie. But never fear! 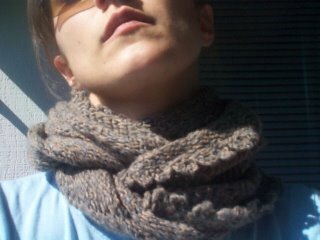 I plan on knitting an obscence amount this summer! When I saw your blog link from "A Bluestocking" I had to come over and take a peek. My last name (now my middle) used to be Liebling! Love your kitty too. Yeah! The summer job out of town! One of the best things about woking in the arts...your vacation before sounds fantastic. The costumes are lovely - flattering and they look easy to dance in. I wish we could see the detail too.